Binibeca - a place for you? is located on the south east coast. Approximately 15 mins., from the Airport. There is no aircraft noise. Binibeca or Binibequer ? The correct name locally is Binibequer and many road signs will use this name. Most english guide books (and the english ) will refer to it as Binibeca. Around this area you will often see 'Bini' used in places names reflecting the Moorish occupation (Bini means 'belonging to the son of…' from Ben Arabic for son. 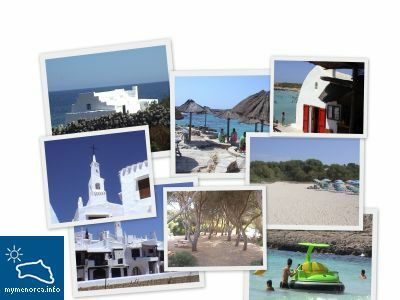 The quiet and idyllic resort of Binibeca is a very popular quieter resort on the beautiful south coast of Menorca, and is a perfect choice for holiday makers wanting to escape the noise and crowds of other more developed areas. You will not find any skyline destroying hotels or large holiday complexes here, most accommodation being in private villas and apartments which are ideal for those seeking a break that feels like a 'home from home'. There is a low rise apartment hotel ( Eden Hotel ) at the western end ideal for couples not looking for full board. Taxi one way is about 22 Euro. At one end of this stretch of coast is Binibequer Vell, a small apartment resort in the style of an old mock fishing village and which offers a range of bars, shops and restaurants in interesting surroundings. At the other end, where the beach is located, lies Binibequer Nou and neighbouring Cala Torret. The beach at Binibeca is a lovely deep beach with gently shelving sands in a quiet cove, offering safe bathing for all. While the resort is quiet ( even by Menorcan standards) and perhaps more a place to chill it is close (by bus, taxi) to Punta Prima (by resort train) , Mahon and Es Castell for much more attractions, buzz and a change of scene. An attractive, deep, fine white sand beach with shaded picnic area at rear and free toilets. Free parking at the rear and at the roadside. The beach waters are protected via a headland on the horizon. Perfect, shallow sandy bottomed and lined on both sides by rocks for great snorkeling. The beach bar of Los Bucaneros (converted fishermans hut ) even serves freshly cooked basic meals as well as snack and hot and cold drinks. Lifeguard. Kayaks ( space for three ) and electric fun boats ( 20 Euro 1/2 hour ) available to hire from beach. Sunbed and umbrella hire. Behind the beach Ice cream, crepes and other food and drink is available. The warm shallow waters of this bay make this resort very popular with families with younger children. Though the beach is big enough if you need your space away from the little beach rats. Big fish shoals hover in front of the Bucaneros outside terrace area for bread, and make for great underwater fish encounters and pictures. Banks can be found in the local town of San Lluis. Ten minutes drive or so along the coast is S'Algar a favourite water sports and diving centre. There are some fabulous high quality restaurants in the pretty neighbouring villages of Torret and S'Ullastrar. The beautiful beach is the cente of day time activities in Binibeca, with electric fun boats amongst others to hire from the beach. The sheltered bay in front of the beach provides great snorkelling. Behind the beach there is a shaded area for beachside picknicks and across the road the is a small childrens play area. There is bicycle hire close to the beach. Nearby Punta Prima (reachable via a resort "train" ) is much bigger and has many more activities on hand. For water sports fans ten minutes drive or so along the coast is S'Algar - a favourite water sports centre. Relatively unknown, there are a couple of free to use public courts on the hill at Binibeca Nou - up the Cami des Cap de Roig about half way up on the left hand side. Bit run down but useable. In nearby Mahon/Sant Lluis there are high quality courts that can be rented. Relax while children enjoy a swim? a pool is available at the bar restaurant Es Furat and is free providing you buy a drink or snack. At Binibequer Vell there is a small selection of souvenir and clothes shops in pleasant surroundings, 2 supermarkets and a cash point. Cala Torret at the eastern end of Binibeca has a nice bakers shop and mini mart. Remember the correct name for this resort is Binibequer and will be written as such on timetables and many road signs. Bus, Taxi and Hire Car - detailed getting about infos. Mahon will mostly be written on timetables, front of buses and signposts as Mao, it's correct local name. Also posted in the local papers eg Ultima Hora Menorca, Menorca towards the back pages are most of the island's current bus timetables. You will nearly always find a copy of this in a cafe bar - make notes, please don't take paper as its there for all to read. If you are staying longer than a week take a trip on this good network and see some of the other resorts/towns first hand. Hourly at 15mins. past the hours - check times locally on stops as they can change. From Punta Prima there are more options to reach Mahon. The majority of Bars and Restaurants are at the two opposite ends of Binibeca - Binibequer Vell ( set in and opposite the mock fishing village ) and at Cala Torret over looking the water. Live music features at Bar Paupa in Cala Torret (5m from beach ). Relaxing ( cocktails ) lounges at Sa Naveta and Sa Cova. In near by Punta Prima and Cala en Porter there are Hotels offering nightime entertainments and discos for big and small.